Draft: 2006, Detroit Tigers, 1st rd. Full name ANDREW MARK MILLER...Married, Katie…The couple has two kids, Max and Hazel...Was named Florida's "Gatorade Player of the Year" as a senior at Buchholz High School in Gainesville in 2003, also earning preseason and Postseason All-America honors that year...Played three seasons at University of North Carolina, going 27-9 with a 2.77 ERA (309.0IP, 95ER)…Set the school's career strikeout record (325) and single-season strikeout record (133K in 2006)… As a junior in 2006, was named the Baseball America "National Player of the Year" and won the "Roger Clemens Award" as college baseball's top pitcher, going 13-2 with a 2.48 ERA (123.1IP, 34ER) in 20 games (18 starts)…Was also the ACC's "Pitcher of the Year" and an All-America first-team selection in 2006...Received a 2016 Thurman Munson award for success on the field and in the philanthropic community...With several Yankees teammates, participated in a program with the MLBPA Players Trust to promote baseball to children on 5/8/15…As part of the event, coached children from the NYC Autism Charter School in a game at Harlem RBI's Field of Dreams...2017-18 Tribe Fest participant...He and Katie are very involved with the Cleveland Food Bank and in 2017 led team efforts with the "Step Up To The Plate" food and fundraising campaign --- a fun challenge w/A.L. Central rival Kansas City, which raised nearly $90,000 for the Foodbanks in each club's city. Enjoyed another dominant season in relief but was limited to just 11 appearances from August 2 through the end of the season due to right knee issues that forced him on to the disabled list twice in August, missing 37 games...Was on the 10-day Disabled List, August 2-17 and again, August 22-Sept. 13…Named an American League All-Star for the second straight year after a first half ERA of 1.42 (7ER, 44.1IP)...His 75 strikeouts over his first 50.0 innings with the club are a franchise record...Owns a career relief ERA of 2.43 (366.1IP, 225H, 99ER, 553SO, 28HR) in 381 games…When healthy he was dominant, recording 49 scoreless outings (57 appearances), 27 holds and limited batters to a .144 average against (31/215)...Right-handed batters hit just .136 (21/154) with 73 strikeouts and an OPS of .424...At the time of his first D.L. stint on August 2 he was 2nd in the A.L. in holds (21), 3rd in relief innings (53.1) and 3rd in strikeouts (77)…Began the season with an 18.0 inning scoreless streak, April 3-May 14...Was the second-highest consecutive scoreless IP streak among Indians relievers in 2017 (Tyler Olson - 20.0IP)...Did not allow a run until his 16th outing of the season on May 15 vs. Tampa Bay, snapping a string of 26 consecutive scoreless outings (regular season) dating back to last Sept. 5 (30.1 IP)...Allowed just 7 extra base hits on the season…Battled leg soreness much of the first half before going on the D.L. on August 2 after walking and hitting a batter the night before in Boston...Made a scoreless, 1.0 IP appearance at AAA Columbus on Aug. 16 and appeared in 2 games with Cleveland (Aug. 18 & 21) before leaving appearance of August 21 vs. Boston after 2 batters and 7 pitches with a re-injury to his right knee...Rehabbed in Cleveland, throwing several simulation games and bullpens before being activated from the disabled list on Sept. 13...Made 9 appearances the last 18 days of the season, covering 8.0 IP (5H, 0R/ER, 16SO)…Pitched for WBC champ Team USA in March…On the year batters hit .114 (13/114, .122 OB%) when behind in the count after hitting .102 (13/127) in 2016 when down in the count...MLB hitters batted .163 (15/92) off him with runners on base...Was 2-for-4 in save situations...Major League hitters are batting .153 (73/477) with a strikeout rate of 42.0% (218/519) since the start of 2016 (MLB rank is 1st)...Indians are 68-15 (.819) in the regular season and .900 (9-1) including the 2016 Postseason when he has appeared in a game since his July 2016 acquisition…From June 17 thru the end of the season he posted an ERA of 1.29 (28.0IP, 12H, 4ER, 45K, 27 games)...ERA was 0.29 (31.1IP, 14H, 2R/1ER, 5BB, 47SO, .131 avg) to begin the season thru 27 games (June 11) before allowing 5 runs (5ER) over 2.2IP over 2 games vs. the LA Dodgers, June 13-14...Has allowed multiple runs in an appearance just two times over his last 131 outings since Sept. 23, 2015... Strikeout rate of 47.7% (53/111) with RISP since the start of 2016…Has allowed an OBP of .213 (110/516) since the start of 2016 and batters are hitting .153 against him over the same span (.467 OPS)…Pitched 9 straight innings without allowing an earned run to end season (0 homers last 15 IP). Had a dominant season in relief, joining the club in late July after a trading deadline acquisition from the New York Yankees…Fanned 14.9 batters per 9.0IP (123 of 275 batters faced; 44.7%) on the season and finished 2nd in the Major League in relief strikeouts (see box at right for A.L. rankings)…In his career in relief owns an ERA of 2.61 in 323 games (303.2IP, 194H, 88ER, 458SO, 1238BF, .179 avg)...Fanned at least one batter in a New York Yankees franchise-record 28 consecutive relief appearances from May 6-July 17 (54K/30.0IP)…Was the longest such streak by a Major League reliever since Cleveland's Cody Allen (29) from 4/29-7/8/15… On the year he posted a strikeout-to-walk ratio of 13.67:1 (123/9)…Combined on the season his ERA was 1.45 (74.1IP, 42H, 12ER) in 70 relief appearances. becoming the first pitcher in 10 years with at least 10 wins and 10 saves in the same season... No pitcher until Miller had ever amassed 10 wins, 10 saves and 20 holds within same season as his 13.67 SO-to-BB ratio was third highest ever (min.70IP) behind Eckersley (18.3, 1990) & Kershaw (15.6, 2016)...Selected to his first career American League All-Star team in July (players vote), going 5-1 with 7 saves and a 1.38 ERA in 38 first half outings for the Yankees (39.1IP, 22H, 6ER, 6BB, 69SO)…Made his All-Star Game debut in 7/12 A.L. win in SD (0.2IP, 2H, 0R)...Finished April with a 1-0 record, five saves and a 0.00 ERA (9.0IP, 3H, 0R, 0BB, 15K) in nine relief appearances, just the seventh Major League pitcher since 1913 (and first Yankee) to complete a calendar month w/at least 15K & 0BB or runs… Since 1913, had the 6th-most strikeouts among Yankees pitchers without issuing a walk in a calendar month…One of 7 Major League pitchers since 1913 to record at least 1.0 scoreless inning and 0BB in each of his first 10 appearances… Mariano Rivera (14G in 2008; 10G in 1998) is the only other Yankee to accomplish the feat… Retired 21 consecutive batters faced between a Tyler White single on 4/7 vs. Houston and a Corey Dickerson single on 4/23 vs. Tampa Bay (14K over the span)… Struck out eight straight batters from his final out recorded on 4/12 at Toronto through his first out on 4/18 vs. Oakland (2nd-most by NYY P since 1961)...Since 2000, only Evan Scribner has recorded a higher strikeout/walk ratio in a season (64K/4BB/2015)...Made his Indians debut on August 1 vs. Minnesota (HR to Joe Mauer)…Allowed runs in just 4 of 26 relief outings with Cleveland and combined on the year allowed runs in just 12 of 70 outings and allowed multiple runs in just 1 of them (Sept. 4 vs. Miami)…Recorded first Cleveland save on Aug. 6 in Yankee Stadium, the first pitcher since 1976 (Tippy Martinez) to earn a save against the NY Yankees after having already saved a game for the Bombers that same season…Over his last 22 appearances from August 13-end of the season recorded an ERA of 1.07 (25.1IP, 11H, 3ER, 2BB, 40SO, .126 avg, 11/87) and from Sept. 8-on he didn't a run in his last 11 games (12.1IP, 3H, 1BB, 20K, .075 avg)...During spring was hit w/a batted ball on 3/30 at Atlanta…X-rays were negative and a CT scan revealed a chip fracture in his right wrist (active on Opening Day)...Was outstanding in the Postseason, going 2-0 w/a save & a 1.40 ERA in 10 relief outings (19.1IP, 12H, 3R/ER, 5BB, 30SO, .179 avg against)....Now owns a 0.98 ERA in 16 career relief outings in the Postseason (3ER/27.2IP, 40 SO in 100 batters faced)...Earned first career Postseason win in ALDS Game 1 vs. Boston; 1st save in Game 3 of ALCS at Toronto)...14 strikeouts were an ALCS record for relievers as his 30 strikeouts in '16 PS were most ever by a reliever in MLB history (Francisco Rodriguez fanned 28 in 2002)...ELIAS: Miller was the first pitcher to produce five-or-more strikeouts in an outing of two innings-or-less twice in his postseason career, let alone in the same postseason, same series, consecutive games, or back-to-back days (did so in Game 1-2 ALCS vs. TOR)... Prev. highest strikeout total by any Indians reliever in a single Postseason was Mike Jackson (16 K's in 1997)...His first 20 strikeouts were most ever in a single Postseason thru pitchers' first 9.0IP (Bob Gibson, 2 others had 17)...15.0 scoreless IP to begin Postseason were most by a relief pitcher in a single Postseason (Goose Gossage: 14.1 IP, 1981)...First pitcher in baseball history with seven relief appearances with at least three K in a single Postseason...Named ALCS MVP. Went 3-2 with 36 saves (in 38 chances), a 2.04 ERA (61.2IP, 14ER) and 100K in 60 relief appearances in his first season as a closer...opponents batted .151 (33-for-218, 5HR); LH .233 (10-for-43, 1HR), RH .131 (23-for-175, 4HR)...retired 46-of-60 first batters faced (76.7%)...allowed just 1-of-12 inherited runners to score (8.3%)...Had an AL-best 14.59 K/9.0IP ratio (61.2IP, 100K), the second-best mark among Major League relievers in 2015...ranked third among Major League relievers with 100K...Following the season, was named the 2015 Mariano Rivera American League Reliever of the Year, presented annually to the league's top relief pitcher as voted on by eight of Baseball's all-time great relievers (Mariano Rivera, Dennis Eckersley, Rollie Fingers, John Franco, Trevor Hoffman, Bruce Sutter, Lee Smith and Billy Wagner)...Reached the 100K plateau for the second straight season (103K in 2014 w/ Boston-69K and Baltimore-34K)...with Dellin Betances (131K), became the sixth bullpen duo all time (first since the 2004 Angels: Francisco Rodriguez-123K/Scot Shields-109K)-and first Yankees duo-with 100K each...according to Elias, he and Betances became the first duo to finish with a league's top-two reliever strikeout totals since the 2009 A's (Michael Wuertz-102K/Andrew Bailey-91K)...Tied the Dodgers' Kenley Jansen for third in the Majors-and tops in the AL-with a 94.7% save conversion rate (36 saves in 38 chances), trailing only the Pirates' Mark Melancon (96.2%) and the Brewers' Francisco Rodriguez (95.0%)...Is the fourth Yankees pitcher in the last four seasons to record at least 35 saves, joining David Robertson (39 in 2014), Mariano Rivera (44 in 2013) and Rafael Soriano (42 in 2012)...according to Elias, the Yankees are the first Major League team since saves became an official stat in 1969 to have four different pitchers record at least 35 saves in four consecutive seasons...Is the first Yankees left-hander to record at least 25 saves in a season since Dave Righetti reached the figure in seven consecutive seasons from 1984-90...is the third left-handed pitcher to record a 30-save season with the Yankees, joining Righetti (4x: 1984, '86-87, '90) and Sparky Lyle (1972)...Did not allow a run in his first 17G this season (17.2IP) from 4/8-5/16... according to Elias, was the longest such streak for any pitcher to begin his Yankees career, and the second-longest streak for a Yankees pitcher to begin a season (Lee Guetterman-19G in 1989)...allowed 1-or-0 hits in each of those 17 games, becoming one of nine pitchers since 1914-and the only Yankee-to hold his opponent scoreless while allowing no more than 1H in each of his first 17 games of a season... his 31K were the most strikeouts by a pitcher prior to allowing his first run of the season in Yankees history (credit: Elias)...Became the third pitcher in Baseball history to allow three-or-fewer hits while pitching at least 15.0 innings over his first 15 games of a season (4/8-5/8, 15.2IP, 3H, 26K), joining the A's Ryan Cook in 2012 and the Dodgers' Chris Withrow in 2014 (credit: Elias)...Is one of eight pitchers in Major League history (and the only Yankee) to record at least 13 saves in his team's first 30 games of a season...became the first pitcher in Yankees history to earn at least eight saves in the club's first 20 games of a season and the second in team history with 10 saves in the club's first 25 games (Mariano Rivera, 10 saves through 25 team games in 2011)...Became the first pitcher in franchise history to convert each of his first 24 save chances with the club (4/8-8/6)-credit: Elias...since the inception of saves in 1969, was the third-longest save streak to begin a career with a new team and second-longest such streak by an AL pitcher (Brad Lidge - first 44 save chances with Philadelphia from 2008-09 and Willie Hernandez - first 32 save chances with Detroit in 1984)...according to Elias, became just the second player to convert each of his first 10 save opportunities with the club, joining Tippy Martinez, who converted 10-of-10 saves over a three-year stretch with the Yankees from 1974-76...Made his Yankees debut in 4/8 win vs. Toronto, tossing a perfect ninth (1.0IP, 1K) for his first save of the season and second of his career (also 9/7/14 at Tampa Bay w/ Baltimore)...Became the first pitcher in Yankees history to record a save and at least 3K in three consecutive relief outings from 4/13-19 (4.0IP, 9K)...the streak was the 15th of its kind in the Majors since saves became an official stat in 1969 and the first since the Dodgers' Eric Gagne from 7/10-17/04 (also three games)...recorded his 500th career strikeout (Rene Rivera, swinging) in 4/19 win at Tampa Bay...Allowed a two-out, two-run "walk-off" HR in the 10th on 5/19 at Washington to suffer his first loss (0.2IP, 1H, 2ER, 1BB, 2K, 1HR)...were the first runs allowed in 2015 after 17 consecutive scoreless appearances... Allowed 2H and 1ER in 1.0IP (2K) to record the save in 6/2 win at Seattle...the two-out, RBI single by Robinson Cano in the 11th inning marked his first earned run allowed in a save situation in his career (18.1IP)...had permitted three unearned runs in a blown save on 6/23/13 at Detroit w/Boston...snapped a career-long streak of 32 games (9/6/14-5/30/15) with 1-or-0 hits allowed...Was placed on the 15-day D.L. from 6/11 (retro. to 6/10)-7/8 with a left flexor forearm muscle strain (missed 25 games)...in one rehab relief appearance w/ Triple-A Scranton/WB on 7/6, tossed 1.0 scoreless inning (2H, 1K)...Earned the save despite allowing a solo HR to Chris Davis in 7/22 win vs. Baltimore (1.0IP, 1H, 1ER, 2K, 1HR), just his second HR surrendered to a lefty batter over his last 96 batters faced since 5/15/14 (also on 9/23/14 w/ Baltimore to Brian McCann at Yankee Stadium)...was his second outing in as many days and third in as many games...Suffered his first blown save of the season in 8/11 loss at Cleveland, allowing 2ER in the 10th inning (1.0IP, 3H, 2ER, 2K) in an eventual 16-inning Yankees loss...Did not allow a run over a 10-game stretch from 8/14-9/6, recording six saves and striking out 18 of his 37 batters faced (48.6%) over the span (10.0IP, 6H, 2BB, 1HP)...earned his first Yankees win on 8/17 vs. Minnesota (1.0IP, 2K)...Tossed 2.0 perfect innings (4K) in 9/12 Game 1 loss vs. Toronto...tossed 2.0 innings in three of his final nine appearances of the season (beginning 9/12 vs. Toronto-Game 1)...had just one appearance of 2.0 innings over his first 51 games of the season from 4/8-9/7...Struck out eight consecutive batters faced spanning three games from 9/12 (Game 1) vs. Toronto through 9/16 at Tampa Bay, marking the longest such streak by a Yankee since David Robertson had eight straight strikeouts in 2012 (credit: Elias)...Tossed a perfect ninth (1.0IP, 3K) in both 9/14 and 9/16 wins at Tampa Bay, earning the save in both games...according to Elias, became the 10th pitcher in Baseball history-and the first Yankee-to earn the save while tossing at least 1.0 inning and striking out every batter faced in consecutive games...Allowed 3H and 2ER in 2.0IP (2BB/1IBB, 4K, 2HR) while earning his third win on 9/22 at Toronto... allowed a game-tying HR in the bottom of the ninth for his second blown save...threw 42 pitches, his most in a relief appearance since 8/4/11 vs. Cleveland (71 pitches)...Tossed a perfect ninth inning (1.0IP, 2K) in the Yankees' AL Wild Card Game loss vs. Houston on 10/6. Combined with Boston and Baltimore to go 5-5 with one save and a 2.02 ERA (62.1IP, 14ER, 17BB, 103K) in 73 reliefappearances…produced career bests in strikeouts, ERA and games…stranded 35-of-42 inherited runners (83.3%)... Led the American League and finished second in the Majors with a career-high 14.87K/9.0IP(Chapman-17.67)…ranked eighth among MLB relievers with a 6.06 strikeout-to-walk ratio…ﬁnished thirdamong AL relievers in opponents' batting average (.153), fourth in strikeouts and tied for ﬁfth in appearances... Held opponents to a career-best .153 batting average (33-for-216); RH .145 (18-for-124, 1HR); LH .163 (15-for-92,2HR)…also held opponents to a career-best .229 on-base percentage... Began the season by making 50 appearances for Boston, going 3-5 with a 2.34 ERA (42.1IP, 11ER)…stranded 24-of-26 inherited runners (92.3%)…surrendered only one run in 26 games while pitching for the Red Sox atFenway Park (23.0IP, 0.39 ERA), limiting opponents to a .105 batting average (8-for-76) in those games... Acquired by Baltimore on 7/31 in exchange for minor league LHP Eduardo Rodriguez…went 2-0 with a 1.35ERA (20.0IP, 8H, 3ER) in 23 appearances for the Orioles, striking out 34 batters with just 4BB... Did not allow a hit in eight consecutive appearances from 7/25-8/7 (7.0IP, 4BB, 12K), the longest such stretch ofhis career…allowed 0H in seven straight outings from 9/6-19 (5.2IP, 0BB, 14K)... Earned his ﬁrst Major League save on 9/7 at Tampa Bay (1.0IP, 1HP)... Made ﬁve scoreless appearances in the postseason (7.1IP), allowing only 3-of-24 batters to reach safely (1H,1BB, 1HP, 8K, .045 opp. BA). Appeared in just 37 games due to a left foot injury suffered in early July. Averaged a career-high 14.1 SO/9.0 IP (48 SO/30.2 IP), the 2nd-highest mark among all MLB relievers with at least 30.0 IP behind CIN's Aroldis Chapman (15.83)...His 2.82 SO/BB ratio (17 BB) was also a career best for a single season. No runs allowed in 29 of 37 appearances. Allowed multiple earned runs in only 1 of 37 outings (3 ER in 0.1 IP on 5/12 vs. TOR)...With the exception of that game, posted a 1.78 ERA (6 ER/30.1 IP)...Allowed multiple runs only twice. Posted a 2.03 ERA (6 ER/26.2 IP) over his final 30 games of the season after recording a 6.75 ERA (3 ER/4.0 IP) in his 1st 7 appearances. Suffered a left foot injury while attempting to back up home plate on 7/6 at LAA...Placed on the 15-day DL on 7/7...Underwent Lis-Franc ligament repair surgery on7/15...The surgery was performed by Dr. George Theodore in Boston, MA...Transferred to the 60-day DL on 7/12. Posted career-best marks in games (53), ERA (3.35), holds (13), WHIP (1.19), opponentAVG (.194), fewest walks per 9.0 innings (4.46), and strikeouts per 9.0 innings (11.38)...NamedRed Sox Fireman of the Year by the Boston BBWAA in 1st full season pitching in relief.Among qualifying AL lefty relievers, finished 4th in opponent AVG, 3rd in opponent SLG (.292), and 4th in opponent OPS (.588)...Since at least 1921, the only Sox LHP with better opponent AVG were Mickey McDermott in 1950 (.183) and Ken Brett in 1970 (.187)...Also marked 3rd-best opponent SLG by a Sox lefty in that time, behind Bill Landis in 1968 (.260) and Chet Nichols in 1961 (.286).Ranked 9th among AL relievers and 4th among AL lefties in relief in K's per 9.0 IP, the 2nd-best mark by a BOS left-handed reliever since at least 1921 after Ken Brett in 1970 (12.04)...Placed 9th among AL lefties in holds, 11 more than previous single-season high (2, 2008 with FLA).Limited left-handed batters to a .149 AVG (13-for-87), the 2nd-lowest mark in the AL (min. 100 batters faced) after LAA's Ernesto Frieri (.069), and lowest AVG by a Sox lefty since at least 1974...Gave up just 1 extra-base hit to a LHB all year, a 2-run shot by BAL's Nick Johnson on 5/23...After that date held LHB to just 10 hits, all singles.Stranded 39 of 46 inherited runners (84.8 percent) for the AL's 5th-best rate...Marked the 8th-best rate by a Red Sox reliever (min. 30 IR) since at least 1974 and 3rd-best by a club left-hander after Tom Burgmeier in 1981 (89.2%) and 1980 (86.8%).Posted team-high 31 hitless appearances and had 22 perfect outings...Retired the 1st batter faced in 45 of his 53 outings for a team-best 84.9% rate (min. 5 G).Issued a walk in just 15 of 53 outings after having allowed walks in 21 of 30 career relief appearances entering the year...Tallied career-high 9 straight walkless tilts, 7/13-8/1 (7.0 IP).Gave up 5 runs in 21.0 IP on the road (2.14 ERA) compared to 10 runs in 19.1 frames at home (4.66 ERA).Allowed just 6 hits, all singles, in 49 plate appearances with runners in scoring position (.158 AVG/SLG).Opened the season on the 15-day DL with a left hamstring strain...Made 12 rehab appearances between Single-A Greenville (2 games) and Triple-A Pawtucket (10 games) before 5/6 activation.Posted 8.0 scoreless innings over 1st 8 games for BOS from 5/6-21...Tallied career-high 9 straight scoreless appearances overall from 9/25/11-5/21/12 (9.0 IP)...Matched that with 9 scoreless games, 8/29-10/1 (6.1 IP).Compiled a career-best 6 straight hitless outings from 5/30-6/19 (4.0 IP).Earned 1st win of the year with 1.2 perfect frames on 5/21 at BAL, his longest career perfect outing...Was the longest appearance with no base runners by a Red Sox on his birthday (turned 27) since Joe Heving on 9/2/40 (G2) at WSH (2.0 IP).Appeared in all 3 Red Sox games from 5/10-12 vs. CLE, his 1st career stretch appearing on 3 straight days...Did it again from 7/27-29 at NYY. Selected to the Sox Major League roster from Triple-A Pawtucket on 6/19 and remained with the club for the rest of the season...Pitched in 17 games with Boston, including 12 starts.Went 6-3 with a 5.55 ERA (36 ER/58.1 IP), 38 strikeouts and 35 walks in 12 starts for the Sox...Allowed 3 runs or less in 8 of his 12 starts but combined to yield 25 runs (23 ER) in his other 4.Boston was 9-3 in his starts and his 6 wins tied a single-season career high (also 2008 with Florida) and marked a new career high as a starter (previously 5 in both 2007 and 2008 with Detroit and Florida respectively).Each of his 1st 8 games with Boston from 6/20-7/31 were in a starting role and was back in the rotation 8/19-9/8, making 4 starts during that time.Posted a 5.40 ERA (4 ER/6.2 IP) with 12 K's and 6 walks in 5 relief outings with the Red Sox.In 3 Interleague starts, was 2-0 with a 3.06 ERA (6 ER/17.2 IP), with the Sox winning each of those outings...Had a 4-3 record and 6.64 ERA (30 ER/40.2 IP) in 9 starts against AL foes (Sox 6-3).Fared better on the road, going 5-2 with a 3.89 ERA (19 ER/44.0 IP) and .259 opponent AVG (43-for-166) in 10 games (8 starts) compared to 1-1 with a 9.00 mark (21 ER/ 21.0 IP) and .382 opponent clip (34-for-89) in 7 home games (4 GS)...Had a 2.79 ERA (6 ER/19.1 IP) in 5 daytime outings (3 GS) while going 2-0, compared to 6.70 (34 ER/45.2 IP) at night to go with a 4-3 record in 12 games (9 starts).Did not lose any of his 1st 4 starts with the club from 6/20-7/7, going 3-0 while the Sox won all 4...Went at least 5.0 innings and allowed 3 runs or fewer in each of those outings, the longest such stretch to start a Red Sox career since John Burkett in 2002 (1st 6 starts)...The last Sox lefty to have a streak of that kind was Jeff Fassero in his 1st 4 starts of 2000.Struck out 6 batters over 5.2 frames of 3-run ball in his Red Sox debut on 6/20 vs. SD (ND, Sox 14-5 win)...Became just the 5th lefty since 1919 to fan 6 or more batters in his Red Sox debut, 1st since Kevin Morton's 9 K's in a complete-game ML debut with Boston on 7/5/91 vs. DET...Also the 1st pitcher to strike out at least 6 in his Sox debut overall since Daisuke Matsuzaka fanned 10 on 4/5/07 at KC.Picked up 1st win in a Red Sox uniform in his 2nd start, 6/26 at PIT...Held the Pirates to 2 runs (1 ER) over 6.0 innings in a 4-2 Sox victory...Marked his 1st win since 9/3/10 vs. ATL and snapped a 6-start winless streak.Yielded a grand slam to Ben Zobrist in the 2nd inning and allowed a career-high tying 7 runs overall spanning 2.2 IP in a loss on 7/15 at TB, falling for the 1st time with Boston...Was his 2nd-career grand slam allowed, also Chicago's (AL) Juan Uribe on 8/3/07. Issued a career-high 6 walks but yielded just 2 hits and did not allow a run over 5.2 innings in a 4-0 win at BAL on 7/20...Since 1994, the only other Red Sox to hold a team scoreless while issuing at least 6 walks in an outing was Matt Clement on 9/24/05 at BAL (6 BB in 5.2 IP)...Was the 1st to do it and earn a win for Boston since Joe Hesketh, 4/17/93 vs. CWS (6 BB in 8.0 IP).Matched a career-high 7 runs allowed (5 ER) for 2nd time in 2011 over 3.2 IP on 7/26 vs. KC but did not factor in the decision as the Sox came back to win 13-9.Fanned a season-high 8 batters on 7/31 at CWS, his 4th-career game with at least 8 K's and 1st since he had 8 on 6/11/09 vs. STL...Also yielded a season-high 10 hits over 5.2 frames but did not decide in the Sox 5-3 win. Finished the season with the Marlins after playing for High-A Jupiter and Double-A Jacksonville...Began the campaign on the minor league DL with a right ankle sprain before being reinstated on 4/30...Made 3 starts at Jupiter upon his reinstatement, going 1-1 with a 1.72 ERA (3 ER/15.2 IP), 23 strikeouts and 15 walks, before a 5/13 promotion to Double-A Jacksonville, where he spent the bulk of the season...Posted a 1-8 record with a 6.01 ERA (57 ER/85.1 IP) in 18 starts for the Suns...Fanned 66 batters but issued 61 walks in those games...Went 0-5 over his 1st 10 starts in the Southern League despite holding opponents to 3 earned runs or less in 8 of those starts...Compiled a 1-1 record with a 3.10 ERA (29.0 IP/10 ER) in 5 July starts in Double-A...Recalled by Florida on 8/19 and finished out the season with the Marlins...Compiled a 1-5 record with a 8.54 ERA (31 ER/32.2 IP), 28 strikeouts and 26 walks over 9 total games (7 starts) with the Marlins...Lost each of his final 5 starts, going less than 5.0 innings in 4 of those 5 appearances. Made two appearances out of the bullpen to begin the season before being inserted into thestarting rotation on April 15...As a starter, recorded a 3-5 mark and 4.84 ERA (74.1 IP/40 ER) in 14 games...Out of the bullpen, had no record and a 4.76 ERA (5.2 IP/3 ER) in six appearances...Tossed a season-high 7.0 innings on May 21 vs. Arizona. Equaled his season-high with 7.0 inningspitched on June 23 vs. Baltimore...Tied a career-best with nine strikeouts on May 21 vs. Arizona. One year to the day, he establishedhis career-high in strikeouts against the same Diamondbacks club...Optioned to New Orleans on July 20, going 1-2 with a 5.79 ERA (18.2 IP/12 ER) in five starts at theMinor League level. Missed some time after rolling his ankle during July 29 start at Nashville. Wasrecalled by Florida on September 6...Prior to his option, was 3-5 with a 4.81 ERA (76.2 IP/41 ER) in 16 appearances (14 starts). Afterbeing recalled, made four appearances with no record and a 5.40 ERA (3.1 IP/2 ER)...Placed on the 15-day Disabled List on April 20, with a right oblique strain. Returned from rehaband reinstated from the DL on May 16. In two rehab starts, had no record and a 1.80 ERA (10.0IP/2 ER), allowing only eight hits with three walks and 10 strikeouts...Earned the win on July 4 vs. Pittsburgh after allowing three runs on eight hits with one walk andfour strikeouts over 6.2 innings. Allowed two home runs in the game, marking first time sinceAugust 3, 2007 vs. the Chicago White Sox that he surrendered two homers in one game...Went 3-1 with a 4.01 ERA (49.1 IP/22 ER) at home, compared to an 0-4 record and 6.16 ERA (30.2IP/21 ER) on the road. Marked career-highs in every category, going 6-10 with a 5.87ERA in 29 games (20 starts) with Florida...struck out 89, rankingthird on the club, while his 107.1 innings was fourth most...Started the season in the Marlins rotation, posting a 5-9 recordand 5.63 ERA (100.2 IP/63 ER) in 20 starts prior to landing on 15-day Disabled List, July 18, with patella tendinitis in his right knee...In six rehab games, went 1-1 with 2.33 ERA (19.1 IP/5 ER) beforebeing returned from rehab and reinstated from the DL,September 1...after reinstatement, moved to bullpen where hewent 1-1 with a 9.45 ERA (6.2 IP/7 ER) in nine appearances...HIs best month of the season was in May, as he went 3-2 with a2.43 ERA in five starts...held opponents scoreless in two of his fivestarts...Won three straight games, April 23-May 10, establishing a newcareer-best win streak...dropped four straight decisions, June22-Sept. 9, equaling a career-long (also 8/3/07 to 4/18/08)...Struck out a career-high nine batters in his fourth win of the season,May 22 vs. ARI...Held left-handed hitters to a .226 (21x93) average and threehome runs, while allowing a .321 (99x322) average and fourhome runs to hitters from the right side of the plate. Saw action with Single A Lakeland and Double A Erie inhis first full professional season, before making 13 startsas a member of the Tigers starting rotation...Opened the season with Lakeland -- compiled a 1-1record and 1.93 ERA (18.2IP/4ER) in his first three startsof the season...Tossed a three-hit shutout in a rain-shortened game onApril 5 versus Tampa -- tied for second in the Florida StateLeague with one shutout...Fired his second complete game on April 16 at FortMyers, taking the loss after allowing an unearned run ineight innings of work -- tied for third in the league with twocomplete games...Limited the opposition to three runs (one earned) overhis final two starts with Lakeland, tossing 13.0innings...had his option transferred from Lakeland to Erieon May 9...Recalled by the Tigers from Erie on May 18 -- made hisfirst major league start that night versus St. Louis, earning his first major league win after blanking the Cardinals onfour hits over six innings of work...first Tigers pitcher toearn his first major league win in his first major leaguestart since Andy Van Hekken did so on September 2,2002 versus Cleveland...Optioned back to Erie by the Tigers on May 22...Posted a 1-0 record and 0.78 ERA (23.0IP/2ER) inthree starts during May with the SeaWolves...Recalled by the Tigers from Erie on June 10...Worked a career-high seven innings in a win overBoston on July 6...Fanned a career-best seven batters on July 23 at U.S.Cellular Field against the White Sox...Compiled a 2-1 record, 3.71 ERA (26.2IP/11ER) and28 strikeouts in five starts during July -- fifth in theAmerican League with 9.45 strikeouts per nine inningsduring the month...Left his start against the Chicago White Sox after fourinnings on August 3 with a mild left hamstring strain --forced to the disabled list the following day with the lefthamstring strain...Assigned to Triple A Toledo as part of an injury rehabassignment on August 15 -- compiled a 9.00 ERA(6.0IP/6ER) and nine strikeouts in two starts...Recalled by the Tigers from his injury rehab assignmentand reinstated from the disabled list on August 24...Compiled a 0-1 record and 19.80 ERA (5.0IP/11ER) intwo starts with the Tigers following his return to from thedisabled list -- optioned to Lakeland by the Tigers onAugust 30...Fared batter against lefthanded hitters with the Tigers,limiting them to a .175 batting average (10x57)...rightiesbatted .312 (63x202) with Miller on the mound -- the .312batting average by righthanded hitters against him wasninth-highest in the American League. The Tigers first-round selection in the June draft, he began his professional career with Single A Lakelandbefore joining the Tigers for his first major league action...Assigned to Lakeland after signing with the Tigers onAugust 8 -- appeared in three games for Lakeland, fanning nine batters in five innings...Recalled by the Tigers from Lakeland on August 28...Made his major league debut on August 30 at Yankee Stadium against New York -- worked a scoreless inning of relief in the day game of a day-night doubleheader...Fanned a career-high two batters on September 5 versusSeattle -- matched the high twice over the remainder of the season: September 24 at Kansas City and September 30 versus Kansas City...Established a career high with 2.2 innings of relief pitched on September 30 versus Kansas City...Named the second-best prospect and rated as possessing the best slider in the Tigers organization following the season by Baseball America. 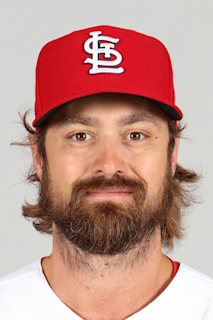 December 21, 2018 St. Louis Cardinals signed free agent LHP Andrew Miller. October 29, 2018 LHP Andrew Miller elected free agency. September 10, 2018 Cleveland Indians activated LHP Andrew Miller from the 10-day disabled list. August 29, 2018 Cleveland Indians placed LHP Andrew Miller on the 10-day disabled list retroactive to August 27, 2018. External left shoulder impingement. August 3, 2018 Cleveland Indians activated LHP Andrew Miller from the 60-day disabled list. July 30, 2018 Cleveland Indians sent LHP Andrew Miller on a rehab assignment to Columbus Clippers. July 28, 2018 Cleveland Indians sent LHP Andrew Miller on a rehab assignment to Lake County Captains. July 24, 2018 Cleveland Indians sent LHP Andrew Miller on a rehab assignment to Akron RubberDucks. July 24, 2018 Cleveland Indians transferred LHP Andrew Miller from the 10-day disabled list to the 60-day disabled list. Right knee inflammation. July 17, 2018 Cleveland Indians sent LHP Andrew Miller on a rehab assignment to Columbus Clippers. May 26, 2018 Cleveland Indians placed LHP Andrew Miller on the 10-day disabled list. Right knee inflammation. May 11, 2018 Cleveland Indians activated LHP Andrew Miller from the 10-day disabled list. April 26, 2018 Cleveland Indians placed LHP Andrew Miller on the 10-day disabled list. Left hamstring strain. September 14, 2017 Cleveland Indians activated LHP Andrew Miller from the 10-day disabled list. August 22, 2017 Cleveland Indians placed LHP Andrew Miller on the 10-day disabled list. Right knee patellar tendinitis. August 18, 2017 Cleveland Indians activated LHP Andrew Miller from the 10-day disabled list. August 16, 2017 Cleveland Indians sent LHP Andrew Miller on a rehab assignment to Columbus Clippers. August 2, 2017 Cleveland Indians placed LHP Andrew Miller on the 10-day disabled list. Right knee patella tendonitis. August 1, 2016 Cleveland Indians activated LHP Andrew Miller. July 31, 2016 New York Yankees traded LHP Andrew Miller to Cleveland Indians for RHP Ben Heller, CF Clint Frazier, RHP J.P. Feyereisen and LHP Justus Sheffield. July 8, 2015 New York Yankees activated LHP Andrew Miller from the 15-day disabled list. July 6, 2015 New York Yankees sent LHP Andrew Miller on a rehab assignment to Scranton/Wilkes-Barre RailRiders. June 10, 2015 New York Yankees placed LHP Andrew Miller on the 15-day disabled list. Strained left forearm. December 5, 2014 New York Yankees signed free agent LHP Andrew Miller. October 30, 2014 LHP Andrew Miller elected free agency. August 1, 2014 Baltimore Orioles activated LHP Andrew Miller. July 31, 2014 Boston Red Sox traded LHP Andrew Miller to Baltimore Orioles for LHP Eduardo Rodriguez. November 4, 2013 Boston Red Sox activated LHP Andrew Miller from the 60-day disabled list. July 7, 2013 Boston Red Sox placed LHP Andrew Miller on the 15-day disabled list. Left foot injury. May 6, 2012 Andrew Miller roster status changed by Boston Red Sox. May 6, 2012 Boston Red Sox activated LHP Andrew Miller from the 15-day disabled list. April 12, 2012 Greenville Drive sent LHP Andrew Miller on a rehab assignment to Pawtucket Red Sox. April 7, 2012 Andrew Miller assigned to Greenville Drive. April 4, 2012 Boston Red Sox placed LHP Andrew Miller on the 15-day disabled list retroactive to March 26, 2012. Left hamstring strain. June 19, 2011 Boston Red Sox selected the contract of LHP Andrew Miller from Pawtucket Red Sox. December 16, 2010 Boston Red Sox signed free agent LHP Andrew Miller to a minor league contract and invited him to spring training. December 16, 2010 Andrew Miller assigned to Pawtucket Red Sox. December 3, 2010 LHP Andrew Miller elected free agency. November 12, 2010 Boston Red Sox traded LHP Dustin Richardson to Florida Marlins for LHP Andrew Miller. August 19, 2010 Florida Marlins recalled Andrew Miller from Jacksonville Suns. May 13, 2010 Andrew Miller assigned to Jacksonville Suns from Jupiter Hammerheads. April 30, 2010 Andrew Miller assigned to Jupiter Hammerheads from New Orleans Zephyrs. April 8, 2010 Andrew Miller roster status changed by New Orleans Zephyrs. March 26, 2010 Florida Marlins optioned LHP Andrew Miller to New Orleans Zephyrs. October 6, 2009 LHP Andrew Miller assigned to Mesa Solar Sox. September 6, 2009 Florida Marlins recalled Andrew Miller from New Orleans Zephyrs. September 1, 2009 Andrew Miller assigned to New Orleans Zephyrs from GCL Marlins. August 23, 2009 Andrew Miller assigned to GCL Marlins. August 23, 2009 Andrew Miller roster status changed by New Orleans Zephyrs. July 30, 2009 New Orleans Zephyrs placed LHP Andrew Miller on the 7-day disabled list. July 21, 2009 Florida Marlins optioned LHP Andrew Miller to New Orleans Zephyrs. May 16, 2009 Andrew Miller roster status changed by Florida Marlins. May 11, 2009 Jupiter Hammerheads sent LHP Andrew Miller on a rehab assignment to Jacksonville Suns. May 6, 2009 Andrew Miller roster status changed by Jupiter Hammerheads. August 4, 2006 Detroit Tigers signed LHP Andrew Miller.